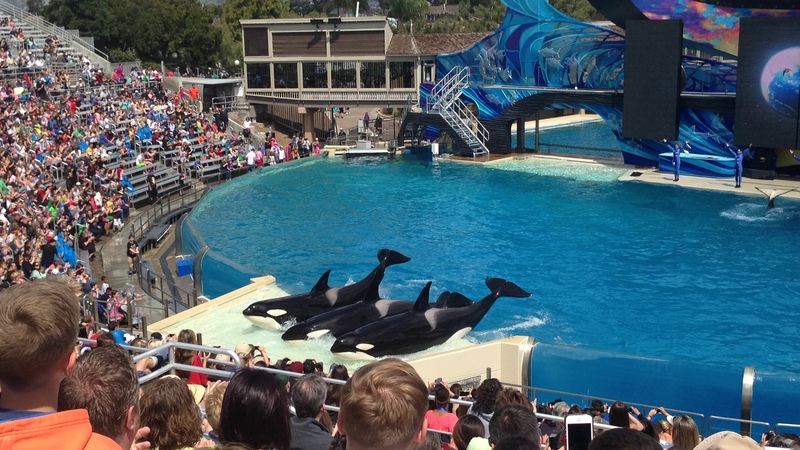 Seeing Seaworld is as much about balancing off what you do between the shows as anything. Like a hyper intermission filled with madly running around and screaming and water and sharks. But there are set times that the dolphins or killer whales come out to play. Crowds gather. Good seats are taken. Snack vendors magically appear. So we had to get there on time. First up, the famous whale show. 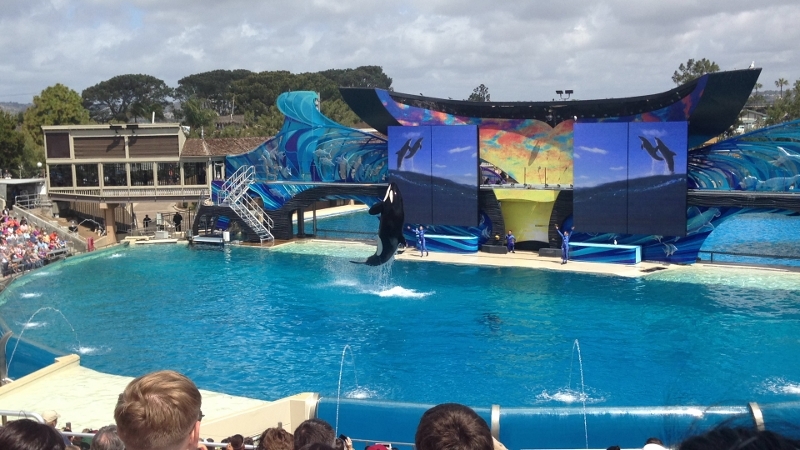 The Shamu Show. Apparently, that’s just the name of the show as none of the killer whales, (and there are 10 of them), are actually called Shamu. Sort of like the how Dread Pirate Roberts name just got transfered from pirate to pirate to handsome, farmer in love with a pretty girl. Besides, who would go see a show named the Corky show? I would expect puppets and a guest appearance by Tom Hanks. So there’s a good reason they kept the name. We decided to see the main show. There were other options. Shamu up and close. Dine with Shamu. Swim with Shamu and see if you can avoid getting eaten. All of these things seemed like a bad idea. They’re not called cuddle whales. So, yeah, main show. We sat up high so as not to get splashed. They had the splash zones clearly marked, and not only marked, but the park guides told everyone coming in that the splash zones were, well, very splashy. Then, later, they made an announcement. Three in fact. If you’re in the splash zones, you’ll get wet. For some reason, this came as a big surprise to some people. I think it’s the same idiots who put a hot cup of coffee in their lap and when it spills scalding hot liquid on their family jewels, sue everyone in sight. Anyway, we were safe. Safer than safe. We were rows and rows away from the last splash zone set of seats. So high up that the air was thin and I think we could have touched the sky. I told the oldest we could and he gave me that look again. Like I’m having a stroke. Now, let me ask you. Was the youngest more excited about the whales or the fact he could get cotton candy? You probably know the answer. However, the oldest was very concerned that the whales might not be treated properly as much as anything and wasn’t entirely convinced these animals should be in a tank giving performances. One of these things I could solve. I got the youngest cotton candy. The other, well, harder to solve. He may be right. But these animals are treated well, they don’t have to worry about starving to death and the trainers really love them. I hoped to open up a bit of conversation about the whales, but it died as the show began. The announcer asked the crowd to thank all the veterans in the crowd. For them to stand. Being me and completely mishearing what was said, I stood. Me and about 50 other men (and a few women). This was odd, thought I. Shouldn’t more be standing to salute the soldiers and sailors and airmen and marines? I don’t think I ever sat down so fast. Then the show started. 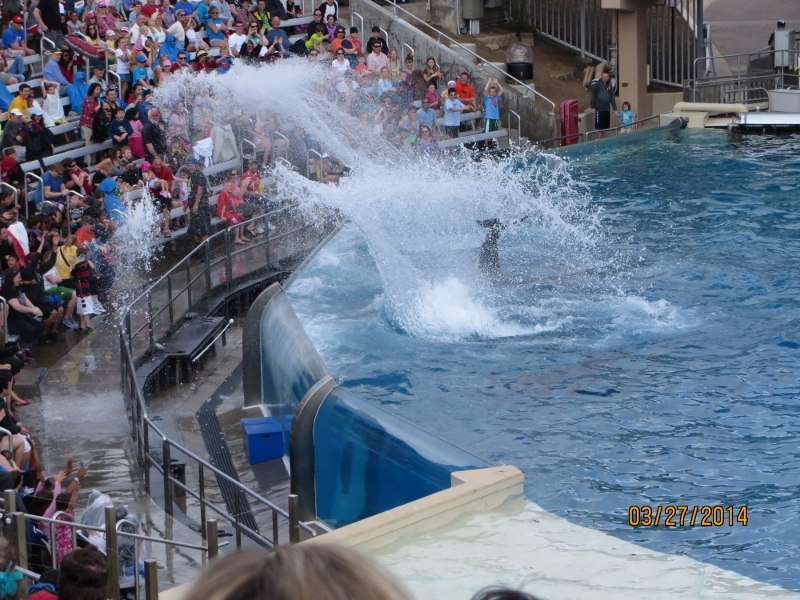 The whales began by circling the tank, jumping in the air, then soaking everyone. I mean, SOAKING them. Like the teenagers at legoland had done. I feared they were out to soak me for pretending to be a serviceman. Howevrer, more than a few people, somehow shocked that sitting so close to the tank would get them wet, ran for their lives like they were being sprayed with acid. Others, those that knew what to expect, laughed and giggled and shouted as water cascaded on top of them. Even a few adults. Personally, I think the whales like this part. Personally I think they’re hoping the chubby, red-haired kid who threw a hot dog in the water will be splashed into the tank so they could take him for a long dive underwater. Yes, some people are jerks, some kids in need of serious parental supervision, but by and large, we’re all well-behaved. We clap when we should clap. We go oooooh and awe when it’s appropriate. We eat lots of snacks that cost as much as a dinner at Denny’s. I love seeing the whales, though. They are magnificent creatures. The youngest stops tearing at his cotton candy to watch them. The oldest seems to be looking at them to make sure they’re not being abused in any way. The Prettiest-girl-in-the-world hugs them both while pointing out the best tricks. When it’s over, I half expect the whale, at some point, to pull himself out of the water and shout, are you not entertained? Nothing bad happens. No one is eaten. None of the whales are hurt or abused. No one drowns. One camera may be a write-off after being soaked, but we’re all good. And maybe, just maybe, we’re all more connected to another living creature. Maybe we’ll think about them when someone brings up drift nets or oil spills or harvesting them for whatever parts we think we may need. 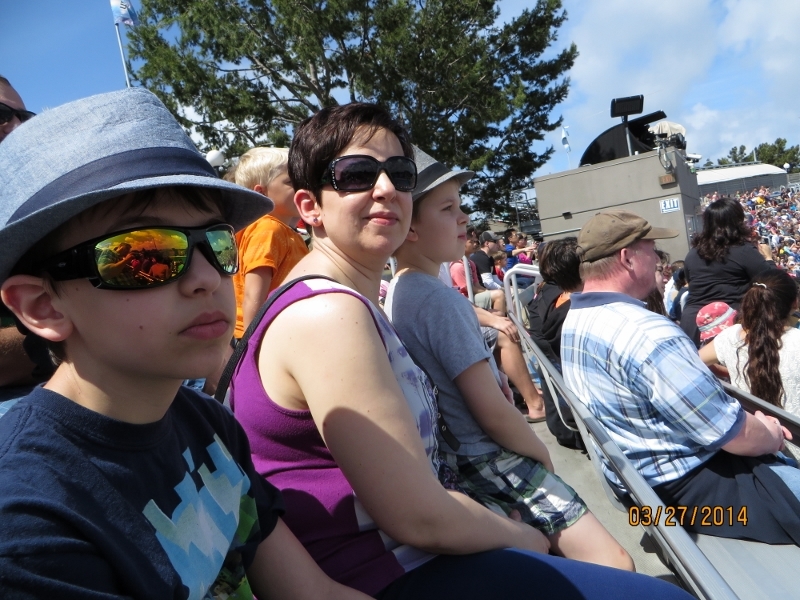 This entry was posted in Blogging, Parenting, San Diego, Travel, Traveling with Kids, writing and tagged corky, denny's, dread pirate roberts, humor, humour, killer whale show, killer whales, prettiest girl in the world, shamu, splash zone, tom hanks, Traveling with children. Bookmark the permalink.